The feeling I had when I found out that NetGalley approved my request was sheer joy and anticipation. Unfortunately, I was in the middle of another book and had to wait just a few days more. 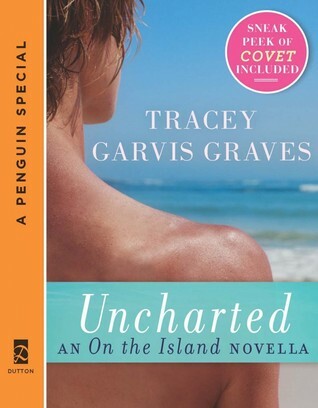 On The Island by Tracey Garvis-Graves is one of my favorite books read this year and when I heard there was a novella, I just couldn’t wait! On The Island was a book I found accidently at the library and then I quickly bought the ebook, knowing I would re-read it over and over, which I did. After reading it, I told everyone I knew to read it and they were just as blown away with the story as I was. I didn’t have my blog back then, but when I started it this year it was one of the first books I reviewed. Also, you must read On The Island first before Uncharted. The expected release will be on July 2nd, 2013 and from what I gather, as an ebook….so you have time to read OTI!! So, Uncharted did not disappoint. I worry sometimes “sequel” books or novellas are going to be “let downs” and that the story wouldn’t live up to the first installment. Not the case here. Tracey Garvis-Graves knows how to build up a story so well and let it unfold which made my stomach ache and nerves on edge. I devoured this story in less than a day and it was as riveting as I hoped it would be. She is wonderful at making the story vivid and come to life as if you were right there with the characters. I’ll try to do my best to review without any spoilers. It may sound cryptic and strange if you haven’t read On The Island. The opening quickly draws you in with the arrival of Owen at T.J. and Anna’s home. He was on the same island (at a different time) in the Maldives and has quite the story to share linking them all together. (Remember “Bones”?…..you finally find out what happened). There are also some parts I didn’t see coming with this original story as well as another character who returns from OTI. When it was revealed, I literally exhaled and had to pause. I love when authors pull that off! The story nicely goes back and forth between Owen’s POV, Anna’s and T.J.’s but mostly it’s Owen’s story with the added bonus of hearing from the other two favorite characters. I loved that Tracey Garvis-Graves lets the reader experience the relationship of Anna and T.J. after OTI and see what they are up to and how their lives were forever changed from the plane crash. With the reveals, she is patient and stealthy and I loved every minute of it! As if it couldn’t get any better, she adds a sneak peak of Covet, her latest novel to be released on September 13th, 2013. Can’t wait to get my hands on it! Tags: adventure, Contemporary Fiction, mystery, novella, romance. Bookmark the permalink.